The general name of this organism is the Gila Monster. The scientific name of this organism is Heloderma suspectum. Heloderma in Latin means "studded skin" and suspectum was given because the founder, Cope, suspected that the lizard was venomous. 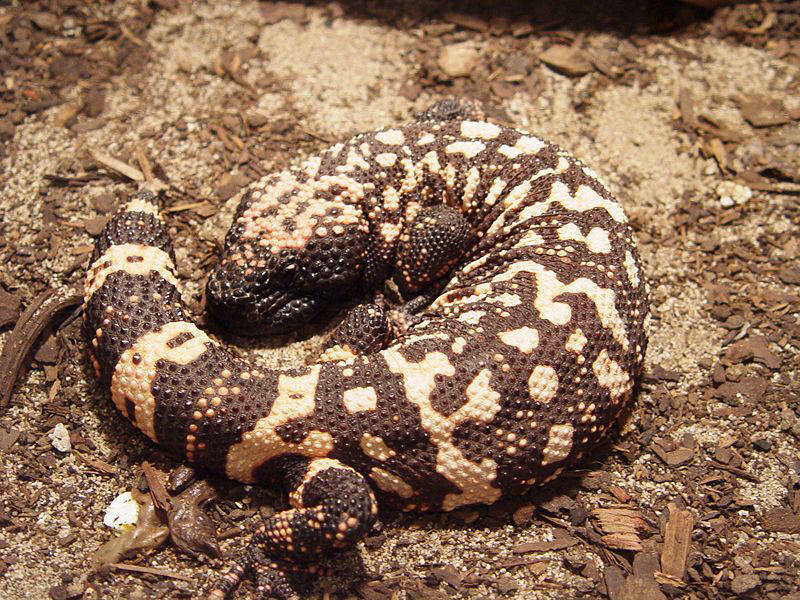 The Gila Monster is classified under the domain Eukarya because they have multicellular cells with complex structures including a nucleus that is bounded by membranes It is heterotrophic, so therefore depends on other organisms for its food, making it part of Kingdom Animalia. The Gila Monsters contains a notochord, a dorsal nerve chord, an endostyle, and pharyngeal slits at sometime in its life, putting it into the Chordata phylum. It is a reptile because it is cold-blooded and covered in scales to prevent their bodies from drying out. The Gila Monster has a movable quadrate bone. This gives the organism the ability to move their upper jaw relative to their braincase, putting it into the Squamata group. The Gila Monster is one of the two venomous lizards making them part of the Helodermatidaes.